When GIS consultants Ollivier and Co. of New Zealand learned about the new raster processing capability available in FME 2007, they decided to put FME to the test! Faced with the challenge of creating a single dataset of raster images from two different image series in different projections, Ollivier and Co. saw this as a natural opportunity to exploit FME 2007’s ability to incorporate both vector and raster data into a workflow. Ollivier and Co.’s original dataset consisted of 2.5 metres per pixel orthophotos made publicly available by the New Zealand government. Some areas had been re-photographed and the new orthophotos issued in a new projection and grid. As a result, these regions were represented by a mix of color and monochrome images that had different capture dates and projections, and were tiled in different grid systems. 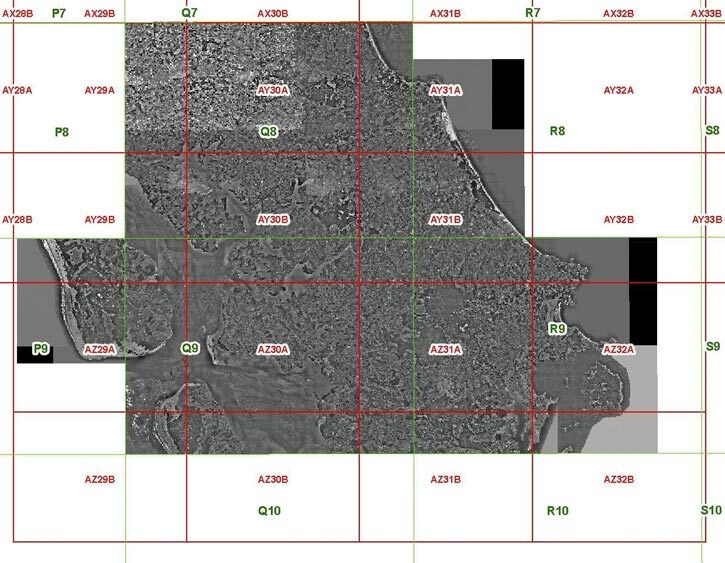 Orthophotos issued prior to 2003, for example, were in NZMG projection in the NZMS260 grid, but orthophotos issued in 2003 and later were in NZTM projection in the NZTopo50 grid. Using a specific combination of transformers in FME’s Workbench application, Ollivier and Co. created a single dataset in one projection that incorporated the latest images available for each region. The FME data transformation workflow first reprojects the older images to NZTM (using FME’s Reprojector transformer), then mosaics the new and old images together (using the RasterMosaicker transformer). Taking advantage of FME’s ability to utilize both raster and vector data, the workflow then uses the vector-based grid index in the new NZTM projection (shown in red) to clip the complete image (with the Clipper transformer) to the new grid, producing a consistent new dataset. With hundreds of tiles to be processed, Ollivier and Co. describes FME’s ability to run the transformation in batch mode as essential to the success of the project.